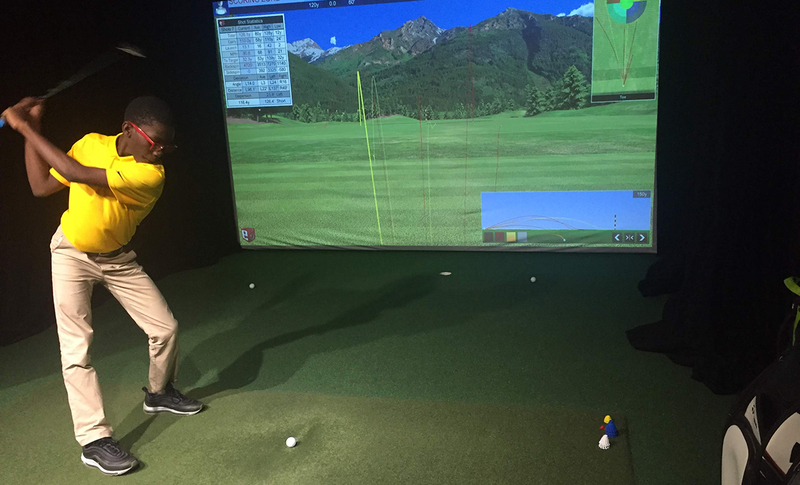 Elijah Opoku is new to golf but embracing the challenge. Elijah Opoku is a 13-year-old 8th grader who lives in Harlem with his mom, dad, and 8-year-old brother, Londyn. He started our program over the summer and is one of our new after school students. He recently fielded some questions from Charlie Hanger, our digital content manager. CH: How did you find out about the program? EO: Through school. The people at Eagle Academy said it was a good program, and that I should try it out. I always said golf would be the last sport I would play, but now it’s the first. I really like exploring the game. It’s fun and challenging, and we’re getting to know the math and physics of how it works. CH: Has your work over the summer and in our after school program paid off in the classroom? EO: Definitely. I wasn’t very good at math and needed help, so the people at Eagle thought this program would be good for that reason. My schoolwork has been on point since I’ve been coming here. My math has gotten way better. I can solve really intense math problems without getting stuck or anything. CH: Are you into any other sports? EO: I’m interested in trying tennis, and I ran track in elementary school. I’m trying to talk to the coaches at Eagle about starting a track team. I want to do distance running. I just really want to get into a competitive mindset with sports, and I want to play on our high school golf team some day. EO: I like to do creative writing and narratives and articles. Sometimes I type articles at the library when I have free time. Sometimes, when I feel like I’m getting a little addicted to video games, I try to use my free time to do something academic. This weekend, I’m going to the library to type up a fundraising proposal for a school trip to Barcelona that I want to go on. CH: Tell me more about this trip. EO: Eagle is organizing a trip to Spain. To go, you need to pay $3,000! I really want to travel around the world and get that experience. My grandmother always told me that as adults, you don’t have as much freedom to travel, so traveling when you’re a teenager is a good idea. In April I went to Costa Rica on a school trip. To earn money for the trip, my mom and I sold cupcakes at school, and my mom worked overtime. We earned $900 selling cupcakes! CH: Are you reading anything now? What are some of your favorite books? EO: I’m about to start “To Kill a Mockingbird.” I’ve always heard about it, but I’ve never read it, and I also want to watch the movie and write an essay about it. My all-time favorite is the “Diary of a Wimpy Kid” series. CH: I hear you have showbiz aspirations. Tell us about your goals. EO: I really want to be an actor. I’ve tried out some classes and programs, and I’m trying to find more acting programs to participate in. I’ve done casting calls and modeled in a fashion show that was put on by Macy’s during Harlem Week. My mom is helping me get my portfolio together so I can apply to LaGuardia, the performing arts high school. CH: What are some of the performance classes you’ve done in the past? EO: I was in Jazz Power Initiative, where we did singing and acting every Tuesday for three months. It was an after school program at Eagle. After the three months, we put on a performance at the National Jazz Museum in Harlem. We sang different rhythm and blues songs, and then did a skit about animals — predators and prey, the circle of life. I was the gazelle. I wanted to be the lion but it didn’t work out. CH: Did you get eaten? EO: Yes, by the king of the jungle.